[S67] The Dallas Morning News, Dallas, Tex., 11 Mar 1969, sec. D, p. 4 (obituary of George W. Jacobie) (not giving the date but stating that he was fifty-seven years old when he died on 9 Mar 1969; not naming the place but describing him as a native of Matawan, New Jersey). [S67] The Dallas Morning News, Dallas, Tex., 11 Mar 1969, sec. D, p. 4 (obituary of George W. Jacobie). [S67] The Dallas Morning News, Dallas, Tex., 25 Sep 2002, p. 31A (obituary of Mary Charles Taylor Jacobie) (stating that he died in 1969 without giving the date or naming the place). [S1076] 1900 U.S. Census, Navarro County, Tex., sheet 12B, line 85 (naming Joe L. Clopton as her father). [S1076] 1900 U.S. Census, Navarro County, Tex., sheet 12B, line 85. [S1076] 1900 U.S. Census, Navarro County, Tex., sheet 12B, line 86 (naming Joe L. Clopton as his father). [S1076] 1900 U.S. Census, Navarro County, Tex., sheet 12B, line 86 (stating that he was born in August 1896 in Texas). [S961] Find A Grave, online at http://www.findagrave.com, memorial for Clifford C. Clopton, memorial no. 101684781, viewed on 6 Sep 2014. [S961] Find A Grave, online, above, memorial for Jessie Louise Hendricks Clopton, memorial no. 101684740, viewed on 6 Sep 2014. [S312] Social Security Death Index, online at http://tinyurl.com/AncestrySSDI, viewed on 11 Jun 2006 (stating that he died in October 1972; not naming the place of death but stating that he lived in Camden, Ark. when he died). [S1076] 1900 U.S. Census, Navarro County, Tex., sheet 12B, line 87 (naming Joe L. Clopton as her father). [S1076] 1900 U.S. Census, Navarro County, Tex., sheet 12B, line 87. Obituary*: "HIGHLY ESTEEMED LADY DEAD. "Mrs. B. M. Clopton Passes Away After Brief Illness. "Mrs. Josephine Clopton, wife of B. M. Clopton, died at 6:15 this morning at the family home, corner of North Beaton street and East Second avenue, after a brief illness. The deceased had been a resident here for nearly twenty years, and was highly esteemed by a large circle of friends, and was an active member of the First Christian church, and of the Rebekah lodge, and was full of good deeds, and loved to bless those who needed her kindly assistance. She was 53 years of age, and besides her husband, is survived by three children by a former marriage. These are Mrs. Crutcher Wooldridge of Midland, Clarence Collier and Miss Annie Laurie Collier, the latter two of Corsicana. "Active—J. D. Ambrose, F. A. Elliott, J. W. Edens, J. R. Webb, Henry Iversen, and Paul Allen. "Remains of Popular Lady Laid to Rest in Oakwood. Note*: • The 1910 U.S. census gives her age as forty-five, indicating that she was born in 1864 or 1865. • She had lived in Corsicana, Texas for twenty years at the time of her death. [S1079] 1910 U.S. Census, Navarro County, Tex., City of Corsicana, sheet 8A, line 19 (stating that she was born in Texas but stating that she was forty-five years old, indicating that she was born in 1864 or 1865). [S961] Find A Grave, online at http://www.findagrave.com, memorial for Josephine M. Clopton, memorial no. 43418644, viewed on 21 Aug 2015 (giving the year but not the place). [S15] Navarro County, Texas Marriages, vol. 2, 1889-1899 (Corsicana, Tex. : The Navarro County Gen. Soc'y, 1987), p. 195 (citing Navarro County, Texas Marriage Records, vol. XI, p. 187) (in which she is identified as Mrs. Josephine Collier in her 15 Dec 1898 marriage to B. M. Clopton, Jr., indicating a previous marriage to Mr. Collier). [S1079] 1910 U.S. Census, Navarro County, Tex., City of Corsicana, sheet 8A, lines 18 and 19 (not giving the date or place but stating that they had been married eleven years). [S15] Navarro County, Texas Marriages, vol. 2, 1889-1899, above, p. 195 (citing Navarro County, Texas Marriage Records, vol. XI, p. 187) (giving their names as B. M. Clopton, Jr. and Mrs. Josephine Collier) (giving the date and county but not the city). [S67] The Dallas Morning News, Dallas, Tex., 17 Dec 1898, p. 3 (stating that they were married in the Christian Church in Corsicana, Texas at 8:00 on the evening of 15 Dec 1898). [S189] Navarro County Cemetery Records, vol. 9, above, p. 156 (not giving the date). [S1207] Corsicana Daily Sun, Corsicana, Tex., online archive at http://corsicana.newspaperarchive.com, 15 Jan 1916, p. 5, col. 1 (obituary for Mrs. B. M. Clopton) (stating that she died at 6:15 a.m.). [S1207] Corsicana Daily Sun, Corsicana, Tex., online archive, above, 17 Jan 1916, p. 9, col. 4. [S1207] Corsicana Daily Sun, Corsicana, Tex., online archive, above, 17 Jan 1916, p. 9, col. 4 (obituary for Mrs. B. M. Clopton). [S961] Find A Grave, online, above, memorial for Josephine M. Clopton, memorial no. 43418644, viewed on 21 Aug 2015 (not giving the date). [S189] Navarro County Cemetery Records, vol. 9, above, p. 156 (giving her name as Josephine M. Clopton). [S1207] Corsicana Daily Sun, Corsicana, Tex., online archive, above, 17 Jan 1916, p. 9, col. 4 (reprinted here with consent of the Corsicana Daily Sun. [S1207] Corsicana Daily Sun, Corsicana, Tex., online archive, above, 17 Jan 1916, p. 9, col. 4 (reprinted here with consent of the Corsicana Daily Sun, with obvious typographical errors corrected). [S1079] 1910 U.S. Census, Navarro County, Tex., City of Corsicana, sheet 8A, line 19 (first bullet). [S1207] Corsicana Daily Sun, Corsicana, Tex., online archive, above, 17 Jan 1916, p. 9, col. 4 (obituary for Mrs. B. M. Clopton) (second bullet). [S1207] Corsicana Daily Sun, Corsicana, Tex., online archive, above, 17 Jan 1916, p. 9, col. 4 (obituary for Mrs. B. M. Clopton) (third bullet). [S198] Supposition as to mother's identity, based on proximity of their graves. [S199] Supposition as to father's identity, based on proximity of their graves. [S189] Navarro County Cemetery Records, vol. 9, above, p. 156 (giving the date but not the place). [S1076] 1900 U.S. Census, Donley County, Tex., City of Clarendon, sheet 7A, line 32. [S1076] 1900 U.S. Census, Donley County, Tex., City of Clarendon, sheet 7A, line 33. [S1076] 1900 U.S. Census, Donley County, Tex., City of Clarendon, sheet 7A, line 34. [S1076] 1900 U.S. Census, Donley County, Tex., City of Clarendon, sheet 7A, line 35. [S1076] 1900 U.S. Census, Donley County, Tex., City of Clarendon, sheet 7A, line 36. [S1076] 1900 U.S. Census, Donley County, Tex., City of Clarendon, sheet 7A, line 27. [S15] Navarro County, Texas Marriages, vol. 2, 1889-1899 (Corsicana, Tex. : The Navarro County Gen. Soc'y, 1987), p. 119 (citing Navarro County, Texas Marriage Records, vol. VI, p. 415) (giving their names as John R. Clopton and Rosie Vallie). [S1076] 1900 U.S. Census, Donley County, Tex., City of Clarendon, sheet 7A, lines 26 and 27 (stating that they had been married nine years without naming the place of marrriage). [S1077] 1930 U.S. Census, Hidalgo County, Tex., City of Edinburg, sheet 2A, line 3. [S1077] 1930 U.S. Census, Hidalgo County, Tex., City of Edinburg, sheet 2A, line 4 (naming Rose Clopton as her mother). [S1076] 1900 U.S. Census, Donley County, Tex., City of Clarendon, sheet 7A, line 28 (naming John R. Clopton as his father). [S1076] 1900 U.S. Census, Donley County, Tex., City of Clarendon, sheet 7A, line 28. [S1079] 1910 U.S. Census, Wichita County, Tex., City of Wichita Falls, sheet 30A, line 22 (stating that he was nineteen years old and was born in Texas). [S1077] 1930 U.S. Census, Tarrant County, Tex., City of Fort Worth, sheet 44A, line 47 (stating that he was thirty-eight years old and was born in Texas). [S1077] 1930 U.S. Census, Tarrant County, Tex., City of Fort Worth, sheet 44A, lines 47 and 48 (indicating that they had been married twelve years). [S1079] 1910 U.S. Census, Wichita County, Tex., City of Wichita Falls, sheet 30A, lines 22 and 23. [S1077] 1930 U.S. Census, Tarrant County, Tex., City of Fort Worth, sheet 44A, line 47. [S1078] 1920 U.S. Census, Wichita County, Tex., City of Wichita Falls, sheet 8A, line 4. [S1076] 1900 U.S. Census, Donley County, Tex., City of Clarendon, sheet 7A, line 29 (naming John R. Clopton as her father). [S1076] 1900 U.S. Census, Donley County, Tex., City of Clarendon, sheet 7A, line 29. [S1077] 1930 U.S. Census, Hidalgo County, Tex., City of Edinburg, sheet 2A, line 4 (stating that she was widowed, was thirty-five years old, and had married at age nineteen, making her marriage date circa 1914). [S1077] 1930 U.S. Census, Hidalgo County, Tex., City of Edinburg, sheet 2A, line 4. [S1077] 1930 U.S. Census, Hidalgo County, Tex., City of Edinburg, sheet 2A, line 4 (stating that his wife, Mabelle, was a widow). [S1077] 1930 U.S. Census, Tarrant County, Tex., City of Fort Worth, sheet 44A, line 48 (stating that W. J. Allen was her father). [S1077] 1930 U.S. Census, Tarrant County, Tex., City of Fort Worth, sheet 44A, line 48. [S1077] 1930 U.S. Census, Tarrant County, Tex., City of Fort Worth, sheet 44A, line 41. [S1077] 1930 U.S. Census, Tarrant County, Tex., City of Fort Worth, sheet 44A, lines 41 and 42. [S1077] 1930 U.S. Census, Tarrant County, Tex., City of Fort Worth, sheet 44A, line 42. [S1074] 1880 U.S. Census, Navarro County, Texas, p. 10, dwelling 85, family 90 (naming S. T. Mallory as her father). [S1074] 1880 U.S. Census, Navarro County, Texas, p. 10, dwelling 85, family 90 (stating that she was five years old on 1 Jun 1880 and was born in Texas). [S1074] 1880 U.S. Census, Navarro County, Texas, p. 10, dwelling 85, family 90 (stating that she was three years old on 1 Jun 1880 and was born in Texas). [S189] Navarro County Cemetery Records, vol. 9 (Corsicana, Tex. : The Navarro County Gen. Soc'y, 1989), p. 86 (naming F. C. Mallory as his mother). [S189] Navarro County Cemetery Records, vol. 9, above, p. 86 (naming S. T. Mallory as his father). [S189] Navarro County Cemetery Records, vol. 9, above, p. 86. [S189] Navarro County Cemetery Records, vol. 9 (Corsicana, Tex. : The Navarro County Gen. Soc'y, 1989), p. 86 (naming S. T. Mallory as his father). [S189] Navarro County Cemetery Records, vol. 9, above, p. 86 (naming F. C. Mallory as his mother). [S1081] Benjamin H. Shoemaker, Genealogy of the Shoemaker Family of Cheltenham, Pennsylvania (Philadelphia, Penn. : B. H. Shoemaker, 1903), p. 307. [S1081] Benjamin H. Shoemaker, Genealogy of the Shoemaker Family of Cheltenham, Pennsylvania, above, p. 307 (naming Edward H. Wilson as her father). 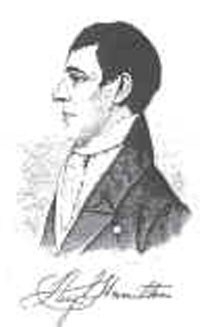 [S1081] Benjamin H. Shoemaker, Genealogy of the Shoemaker Family of Cheltenham, Pennsylvania, above, p. 307 (naming Edward H. Wilson as his father). [S1081] Benjamin H. Shoemaker, Genealogy of the Shoemaker Family of Cheltenham, Pennsylvania, above, p. 307 (naming Sarah Howell as her mother). [S1081] Benjamin H. Shoemaker, Genealogy of the Shoemaker Family of Cheltenham, Pennsylvania, above, p. 307 (naming Sarah Howell as his mother). [S1081] Benjamin H. Shoemaker, Genealogy of the Shoemaker Family of Cheltenham, Pennsylvania (Philadelphia, Penn. : B. H. Shoemaker, 1903), p. 307 (naming Edward H. Wilson as her father). [S1081] Benjamin H. Shoemaker, Genealogy of the Shoemaker Family of Cheltenham, Pennsylvania, above, p. 307. Hugh Hamilton, courtesy of "Ray" on www.findagrave.com. • His biography, which is not reprinted on this site because of possible copyright restrictions, appeared in the Indiana Evening Gazette, Indiana, Pennsylvania, on 30 Jun 1925 and is available online through www.newspapers.com here for a fee. [S1082] William Henry Egle, Pennsylvania Genealogies, Chiefly Scotch-Irish and German (Harrisburg, Penn. : Harrisburg Pub. Co., 1896), p. 322. [S1082] William Henry Egle, Pennsylvania Genealogies, Chiefly Scotch-Irish and German, above, pp. 322-24 (naming Hugh Hamilton as his father). [S961] Find A Grave, online at http://www.findagrave.com, memorial for Adam Boyd Hamilton, memorial no. 139486266, viewed on 29 Jun 2016 (naming Hugh Hamilton as his father).